Greg Golson is known to Yankee fans for one incredible throw in 2010. However, despite the greatness of that moment, there was more to his baseball story. Golson was drafted 21st overall in the first round of the 2004 MLB Draft by the Phillies. A five-tool prospect, Golson describes himself as not raw but needing development. The Texas high schooler had blazing speed and a cannon of an arm. His bat and power were expected to come along with Baseball America saying “there’s really nothing he can’t do” in their scouting report. Golson slowly worked his way up through the Phillies’ system, hitting as many as 13 home runs in a season and stealing up to 30 bases. He even got a cup of coffee and six at-bats in September for the 2008 World Series champions. However, he couldn’t put it all together before he was traded to Texas after the season. 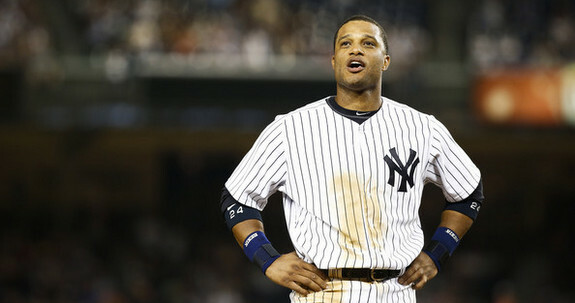 The outfielder was designated for assignment by the Rangers after 2009 and landed with the Yankees in a trade. Though he would make the Show with the Yankees as well, he never got the opportunity to be a regular, partially due to the misfortune of playing for three teams in the midst of postseason windows. Golson received his first call-up to the Yankees on May 4, playing in one game before getting optioned three days later. He hadn’t been hitting all that well in Triple-A to that point, but Alfredo Aceves hit the shelf with a bulging disk on May 12, getting Golson right back up the to the Majors. Though it was 1 a.m. right after a game, Golson quickly got packed with excitement and boarded a plane to Detroit, meeting the Yankees before a game with the Tigers. He was 0-for-7 in his MLB career before the matchup and entered as a defensive replacement for Marcus Thames. In the ninth inning, he got the plate and smacked a single for his first career hit. Golson remembers getting the clubhouse after the hit, “I wouldn’t say I was walking, I was floating.” His favorite player growing up was Derek Jeter, who came up to him. Golson would get into four more games with his first Major League start before getting optioned down on May 17. He’d spend the summer in Scranton and he found his hitting stroke in the process with a solid .263/.313/.414 line despite a slow start. With expanded rosters, the Bombers called up Golson in September and utilized him almost exclusively as a pinch-runner and defensive replacement. Nick Swisher was slowed by injuries and Brett Gardner also missed some time, creating an opening for Golson. He went 0-for-2 in stealing bases during the 2010 season, but his defense did all the talking. With the combination of fabulous speed and a rocket arm, he was the perfect man to come in for Swisher, Austin Kearns or whomever manned the corner opposite Gardner. Golson wanted the opportunity to show off his swing, spending plenty of time in the cages while in the Majors. Despite his best efforts, it would be a game in which he didn’t bat that gets remembered years later. The Yankees were fighting with the Rays for the AL East crown in 2010 and had a series in Tampa Bay in mid-September with a half-game lead going into it. New York didn’t have pressure to win the division with the wild card in hand. Furthermore, a wild card berth meant facing the Twins instead of the upstart Rangers in the ALDS. Regardless, the Pinstripers lost Game 1 on a Reid Brignac walk-off homer. Game 2 on Sept. 14 was a wild affair with the Yankees see-sawing from up 6-0 in the top of the 5th inning to down 7-6 after the bottom half, before knotting the game at seven in the sixth. It stayed that way into extra innings, though Golson entered in the ninth after Juan Miranda pinch hit for right fielder Colin Curtis, who was filling in for Swisher. Despite a desire to start, Golson was primed for filling-in after coming up with a National League team, thereby dealing with pitchers hitting and double switches. It was just a few days before Golson’s birthday and his brother, who was stationed in Jacksonville, came down to watch him play at the Trop. Therefore, the 25-year-old outfielder was already loose simply with family in town and a Yankees uniform on his back. He came into the series knowing playing time was likely thanks to a lefty-laden Rays staff. Though he’d done the proper cage work in game, he hadn’t gotten a chance to fully stretch out his arm. That’s where Gardner helped out. In the top of the 10th, Posada hit a solo home run to put the Yankees up, 8-7. That meant Mariano Rivera would have the chance to close things out in the 10th. An inauspicious start met Mo with Carl Crawford singling through the right side. Evan Longoria, ever the Rivera killer, flew out to deep center for the first out, though Crawford didn’t tag up. Crawford then stole second, though Golson remembers him being out before the ball came out of Jeter’s glove. Matt Joyce stood at the plate and lifted a fly ball down the line to right, an easy catch for Golson but seemingly far enough to advance Crawford to third. This was, of course, prime Crawford, who stole 46 bags in 2010, down just five steals from a career-best 51 in 2009. “When the ball went up, I know the first thing I thought was, ‘Just catch it. Don’t worry about getting behind it,'” Golson recalled. “It was going in and out of vision because of the roof. Still, flatfooted or behind the ball, Golson was ready when Crawford tagged up. He nailed the Rays’ speedster on a low line-drive of a throw and a good pick and tag by Alex Rodriguez.
? Funny enough, Golson aimed his throw at Jeter, the cutoff man, and simply wanted the shortstop to snag it. Jeter realized there was a play at third and leaned out of the way. While that was Golson’s shining moment in pinstripes, he did make the Yankees’ postseason roster that fall. He made a shoestring grab to finish off another Rivera save in Game 1 of the ALDS, his only putout and opportunity in three postseason appearances. He would also briefly play for the 2011 Yankees, finishing with 35 plate appearances over the two seasons with eight hits, two RBI and a .235/.257/.294 batting line. Golson bounced around between Double-A and Triple-A for the White Sox and Braves in 2012-13 before turning to independent league baseball. As for why he never made it back to The Show, Golson now sees some of what the younger version of himself couldn’t at the time and that he was too willingly pliable to coaches. Golson began to figure out more about his game once he got out of affiliated ball, playing in Mexico, Venezuela and the Dominican Republic as well as stateside. Once there, he lost concern for how his game looked and his pedigree as a former first rounder and big leaguer. The 33-year-old is now finishing up a degree in health and wellness this August. When he first began taking classes online, he made it his goal to play until he got the degree and he’s been in the Atlantic and Mexican Leagues in recent seasons before joining the Texas AirHogs of the American Association last year. He’s a free agent for now, living in Denver and passing some baseball lessons on as an instructor. Still, he can sometimes struggle to look back on his playing days. As a right-handed player for platoon purposes and coming through the systems of competitive teams, Golson didn’t get the chance he might have had on a rebuilding roster. Think about it. He got into 40 MLB games and hat 42 plate appearances, something most of us have or will never experience, but it was just that, 40 games, never more than a month at a time. Therefore, Golson has gratitude for being able to live out his dream and play for the Yankees, yet he also wanted more. In two weeks and six days, RAB will close its internet doors after more than 12 years covering the Yankees. I am bummed we won’t get to cover another World Series, or CC Sabathia’s final season, but we were around for one championship and almost all of Sabathia’s time in pinstripes, and that’s pretty cool. Lots of blogs never got to experience a title or a player as awesome and lovable as CC. When it’s all said and done the RAB era will have covered 2,034 regular season and postseason Yankees games, assuming no rainouts the next 20 days. Turns out Game 161 last season, the game in which the Yankees broke the single-season home run record, was the 2,000th game of the RAB era. Fitting, given my unabashed love of dingers. Twelve years is an eternity in the blog game. Doing the math and seeing RAB has been around for over 2,000 meaningful games really drove home the point for me. We’ve been at this a long time. Naturally, some of those 2,034 games are more memorable than others, and for different reasons. Maybe the game itself was exciting. Or maybe you were at the ballpark with a friend or family member, and it was just a great all around day. Whatever the reason, baseball is pretty great, and the Yankees have spoiled us with many awesome games the last 12 years. Even the bad years (2008, 2013, 2004, 2016) weren’t that bad. RAB has never seen the Yankees win fewer than 84 games. Could be worse. What follows is my personal ranking of the five most memorable Yankees games of the RAB era. This is not intended to be a “correct” ranking. It’s my personal list and everyone’s personal list will be different. For whatever reason, these are the games that most stick out to me from the last 12+ seasons. Kinda random, I know, but this game has always stuck out to me. For starters, it was Montero’s debut, and he was supposed to be the next great Yankee. Remember his two-homer game against Jim Johnson and the Orioles? That was so cool. Alas, things didn’t work out the way everyone hoped. Montero was traded after the season and eventually ate his way out of the big leagues. He turns 30 (!) in November and hit .273/.349/.382 in the Mexican League last year. Secondly, this was a really important game! Yankees vs. Red Sox at Fenway Park, separated by one game in the standings atop the AL East. Montero did nothing in his MLB debut (0-for-4 with a strikeout and a hit-by-pitch), but Andruw Jones worked a 14-pitch walk against Al Aceves in the seventh inning, setting up Russell Martin for the go-ahead double. Mariano Rivera struck out Adrian Gonzalez with the bases loaded to end it. Good ol’ fashioned “this game is gonna make me puke!” baseball at Fenway. The game itself was unremarkable. I remember Andy Pettitte started, Mariano Rivera closed, and Jose Molina hit the final home run. The box score tells me Johnny Damon also hit a home run, Hideki Matsui batted eighth (?!? ), and someone named Chris Waters started for the Orioles. Imagine being an up-and-down arm for the 93-loss Orioles in 2008, and it just so happens you line up to start the final game at Yankee Stadium. Wild. This game stands out more because of what happened afterward — there was Derek Jeter’s speech, and I specifically remember telling a friend it felt like the Yankees won the World Series while the team made their lap around the warning track — and because it marked the closing of the ballpark I grew up in. It was a sad day. The new Yankee Stadium is pretty cool (yay modern amenities! ), but the old Yankee Stadium had an irreplaceable charm. I’m man enough to admit I teared up during all the postgame ceremonies. Over a building! Surely no one expected the 2009 World Series to not land in here somewhere, right? The entire 2009 postseason run had some very memorable moments. There’s the Alex Rodriguez game-tying home run against Joe Nathan in ALDS Game Two, A.J. Burnett coming up huge in World Series Game Two, and Johnny Damon’s double steal in World Series Game Four. It was a fun few weeks, no doubt. Game Six was both a great baseball game and the World Series clincher. I remember thinking the series was over as soon as Hideki Matsui hit that home run against Pedro Martinez. Kinda foolish, I know, but I was feeling really good about things as soon as the Yankees took the lead. Matsui drove in six runs in the game, Damaso Marte struck out peak Chase Utley and Ryan Howard on six pitches in the late innings, and of course Mariano Rivera closed it out with a five-out save. The 1996 World Series was the first title I saw and I’ll never forget it. Especially since baseball crushed my soul for the first time the previous year. The 2009 World Series is special because it had been so long since the last championship. I was young and naive in the late-1990s/early-2000s. I started to take winning titles for granted around 1999 and 2000. The 2000 World Series was special because of the Subway Series though. That was really cool, especially coming from a family of (mostly) Mets fans. I’d love to see another Subway (World) Series at some point. It would be crazy fun. Say what you want about the fairness or unfairness of the one-and-done Wild Card Game, but wow does it make for great baseball theater. It is Game Seven without the hassle of Games One through Six. I don’t think the winner-take-all aspect is particularly fair in a sport that is about marathons, not sprints, but it does well for MLB (ratings, buzz, etc. ), so I don’t think the format is changing anytime soon. It is what it is. The 2017 Wild Card Game packed a lot into nine innings. A lot of action and a lot of emotions. There was the shock and sense of dread after the Twins jumped on Luis Severino for three runs in the first inning. The euphoria of the Didi Gregorius game-tying home run. Brett Gardner pimping a home run. David Robertson throwing 3.1 innings and 52 pitches. Something happened every inning and all while the season was on the line. It was … intense. Perhaps recency bias is playing a role here and I’ll look back in a few years and wonder why I have this game so high on my personal list. That said, the 2017 season was the start of a new era of Yankees baseball, and the Wild Card Game was the first time we saw this team in action in October. If the Yankees score six runs in the first and run away with it, this game doesn’t make the list. They had to make a big comeback though, and the game was very exciting, plus the Yankees were a young up-and-coming club for the first time since 1996. It was a lot of fun and it’s going to stick with me for a while.
? … but the Yankees still had a three-game series in Boston after that. Jeter went 2-for-4 in that series and he walked off the field for the final time following a third inning infield single at Fenway Park. I’ll remember the A-Rod farewell game for two things. 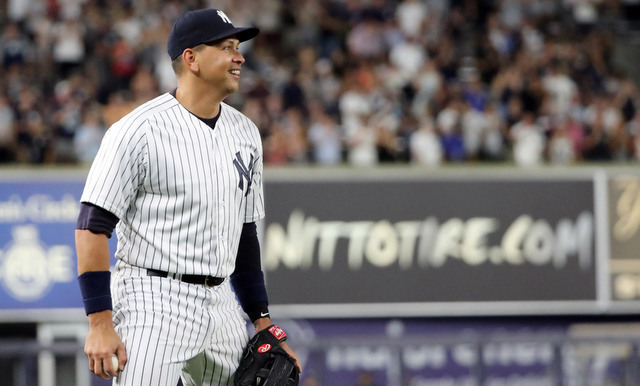 One, it started raining during the pregame ceremony (only A-Rod), and two, he returned to third base for one batter at the end of the game. That was pretty cool. Jeter’s walk-off hit was an incredible storybook ending and Pettitte going out with a complete game was awesome. For me, Rivera’s farewell is the most memorable. Jeter and Pettitte going to the mound to take him out was an all-time great moment, and seeing Rivera bawl his eyes out while hugging Pettitte was very emotional. I always saw Rivera as this larger than life baseball god who never got rattled by anything, yet there he was breaking down in Pettitte’s arms. I will never ever forget it. I did not realize Jeter’s 3,000th hit game and the Sabathia vs. Shields duel were on back-to-back days! I had a 20-game ticket package in 2007 and it felt like I saw A-Rod hit 30 home runs in those 20 games, including that walk-off grand slam against Ray. What a monster season that was. With all due respect to 2017 Aaron Judge and various Robinson Cano seasons, 2007 A-Rod was the best player of the RAB era. Hands down. Man that was fun. Similarly, Didi’s first home run against Corey Kluber in ALDS Game Five two years ago was the first time I truly believed the Yankees had a chance to complete the comeback. After going down 0-2 in the series, I just kinda assumed it was over. The Indians were insanely good that year. Instead, the Yankees won Games Three and Four, then Gregorius sent a first inning message in Game Five. It was awesome. We may not have gotten four World Series in five years, but I feel fortunate RAB existed these last 12 seasons. Again, even the bad years weren’t that bad. We saw a World Series title, more than a few generational players come through town, and the Yankees go through a rebuild transition that resulted in one of the best cores in the game. There were many memorable games and moments along the way. More than I could ever fit into one post. The games above are my personal favorites.